This article was written by Ed Hatton for the column the Start up Coach and published by the South African edition of Entrepreneur magazine in June 2011 and is posted here by their kind permission. An entrepreneur is planning to start cattle farming, but has very little economic or entrepreneurial background as he works in the medicine field. He wants to know what the growth in capital ia that is needed by a business during its first year to sustain further development and growth. This is question all start-up entrepreneurs should ask themselves. The focus is usually on the initial capital needed to start operations, but sustaining the business past the first year is equally important. To answer the question we need to take a step back to the business plan for the new venture. This should start with how much the entrepreneur wants from the venture as a monthly income and / or capital gain. That will tell him how many calves he will have to sell each year if he makes assumptions of the sale price and cost of breeding, rearing and sale. The estimated yield will tell him how many breeding cows he will need. The size of the breeding herd and the capacity of the land to produce grazing and fodder will tell him how much land, labour and infrastructure he needs. These factors will determine his start up capital needs Then he needs to do the cash conversion cycle (from when cash is laid out to produce stock to the time cash is paid as a result of sales) and work out the operating cost of running the business during that period to establish his working capital needs. In downtown Johannesburg a fast food takeaway used to bake large pizzas, and sell them by the slice. Each time I bought a slice I noticed that the attendant chose the biggest available slice for me. As you can imagine, that made me feel really good. When a new pie was delivered for the oven the same rule applied – first sell the biggest slice. So the takeaway gained great goodwill and encouraged customers to come back. Maybe they sold 50 or 60 slices of pizza a day, that meant 50 or 60 customers feeling special, feeling valued. What was the cost of this? Nothing. That’s right, not a cent. 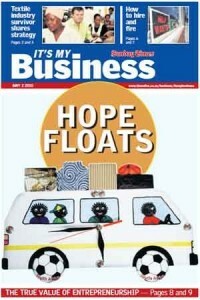 There was an inspiring story in the “It’s My Business” entrepreneurial supplement to the Sunday Times of 2nd May 2010. It described the business journey of Michael Rademeyer an entrepreneur in the clothing industry. The full article can be viewed online at the Times Live website. I have quoted from the article and acknowledge the fine work of It’s My Business and journalist Hendri Pelser on bring this incredible story to the public.